It’s official — summer is finally here. The first official day of summer was June 20th, and now that it’s finally here, it’s time to enhance your outdoor space with the perfect patio furniture. When it comes to lawn and garden furniture, you have a plethora of options to choose from, so how do you pick out the perfect furniture for your space? The experts at Parr’s Furniture have come up with this list of tips to help! #1. Think about how you’ll use the space. Before you can pick the perfect furniture for your outdoor space, you need to determine what you want to use the space for. Are you planning on having family dinners out on the porch? If so, look for an outdoor dining set. Do you want to use the space for parties or gatherings? If so, an outdoor sofa and some chairs may be the best choice for you. Are you hoping to create the perfect space to work on your tan or lounge in the sun? If so, look for a chaise lounge or rocker to relax in. No matter how you plan to utilize your outdoor space, you can rest assured that Parr’s Furniture has the perfect options for you. #2. Try before you buy. Shopping for furniture online can be difficult. No matter how good the picture looks or how much you love the product description, it’s not always easy to get the full scope of the furniture you’re buying when you buy it online. When you come in to our brick and mortar store in Lawrenceville, you’ll be able to try out our furniture in person before you buy it. Whether you’re shopping for indoor or outdoor furniture, comfort is key, and the only way to know how comfortable a piece of furniture is before you buy it is to take a seat! #3. Choose furniture that is low maintenance. Outdoor furniture has to put up with a lot more abuse than indoor furniture. The sheer fact that outdoor furniture is exposed to the elements means that it inherently needs more attention and maintenance than indoor furniture, but some furniture is better suited to the great outdoors than other furniture. When you shop outdoor furniture, make sure you look for furniture that is low maintenance and designed for all weather. Here at Parr’s Furniture, we are proud to say that we offer some of the best, most durable and most resilient furniture in the Atlanta area. When it comes to your outdoor furniture, it’s important not to sacrifice quality in order to save money. As we mentioned, your outdoor furniture has to be able to face the elements, and if you purchase lower quality pieces, there’s a high likelihood that it won’t last as long. However, just because you’re looking to purchase high-quality furniture does not mean that you should resolve yourself to breaking the bank. 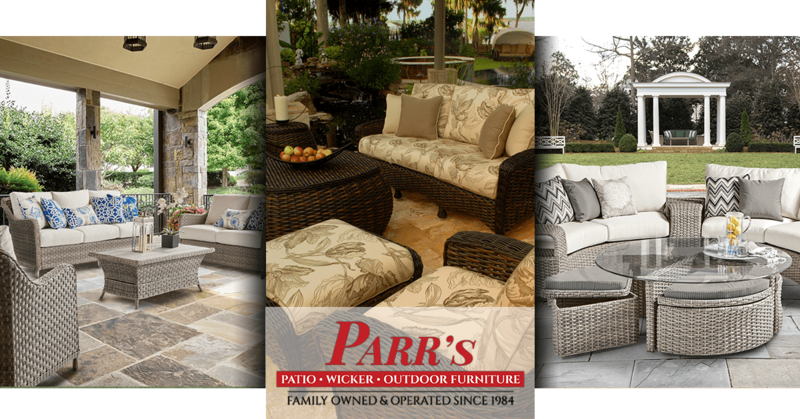 When you shop with us at Parr’s, you can enjoy the best of both worlds because we offer the highest quality outdoor furniture at discounted prices. #5. Take advantage of professional expertise. Buying furniture may seem straightforward, but not everyone has an eye for style or design, and if that sounds like you, you’ll be glad to know that Parr’s Furniture can help. In addition to offering discounted outdoor furniture, we are proud to say that we also have a degreed Interior Designer on our team. With our expertise on your side, you’ll have professional help in determining the color and style of the furniture you choose, as well as the layout of your outdoor space. Our Interior Designer’s services are available to you at a minimal price, and choosing to take advantage of our expertise will help you to create the ultimate outdoor space. Take your outdoor space to the next level with Parr’s Furniture. Picking out patio furniture for your outdoor space isn’t always easy, but with a little know-how and Atlanta’s best furniture store on your side, you can take the guesswork out of the process. If you have any questions or concerns about how to pick out the perfect outdoor furniture, feel free to give us a call! You can also feel free to stop by one of our brick and mortar locations in the Atlanta area. We look forward to helping you take your outdoor space to the next level! ©2017 Parrs Furniture - Do not copy. All rights reserved.